In 1939 East Liverpool City Directory 413 was listed as Smith George C & Son Wall Paper. There was no mentions of a 413 1/2. It was still listed as such in the 1951 City Directory with a Cunninghant Wm L living abovce in the Apartment. In the 1970 City Directory we find 413 Town Tavern restr 413½ Vacantand that is the same listing in 1980. In 1990 just Town Tavern. 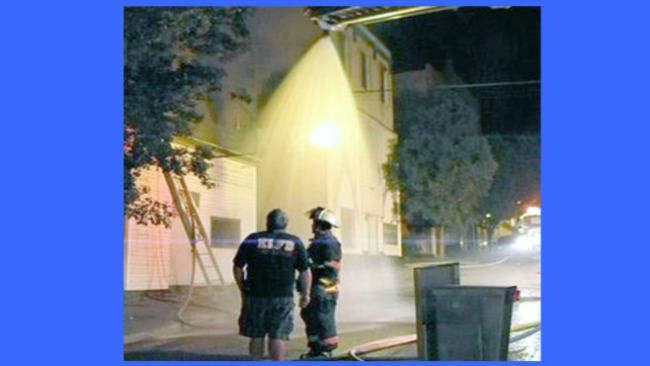 EAST LIVERPOOL - A former Market Street tavern was damaged by fire late Sunday night, and while firefighters were battling the blaze, a second alarm was raised for a structure fire on Avondale Street that has been deemed "very suspicious." The three firefighters on duty responded at 10:55 p.m. to a 911 call of a fire at the former Town Tavern, 413 Market St.
As they left Central Station, the firemen could see heavy smoke billowing above the downtown and immediately called for a third alarm, according to Chief Bill Jones, who said 12 of the department's 13 firefighters responded, with one on vacation. Morning Journal/Jo Ann Bobby-Gilbert East Liverpool fire Chief Bill Jones (left) and assistant Chief David Edgell confer outside the Town Tavern, where a fire late Sunday night damaged the building, which was already scheduled to be razed. Upon arrival, firefighters found heavy flames coming from the rear of the building but quickly had it under control. "They got a pretty good stop on it because we got the call early enough to make a good interior attack and good exterior attack," Jones said. The aerial truck was used to pour water over the roof of the building as firefighters worked inside. He said the building could be repaired, although that is a moot point, since it is slated for demolition along with others along that stretch of Market Street to pave way for the new Market Street Lofts project. The building is owned by Soaring Eagle LLC. Although no longer inhabited, the building did have gas and electric connected, and Jones said there were large high-power lines and three large transformers near the building that provide power to the downtown area. He said he "has an idea" where the fire started but not what started it, saying that remains under investigation, saying, "I don't know at this point if it's suspicious." While firefighters were battling the Town Tavern blaze, a second 911 call came in from the police department at 11:30 p.m. of a structure fire at 1009 Avondale St., owned by Keith Burke. City police were also on the scene, providing traffic control. Three doors across the front. Far left to the downstairs businesses. Middle door to the apartment upstairs. Door on right downstairs business. We were asked not to enter this building because of the possible danger involved. We did pretty much follow that request. The door on the right was partly open. So we stuck our head and camera inside. On the right hand side at the rear was a doorway with either no door left or was wide open so again camera and psrt of body looked in. This wraps up the only internal pictures we have of this building.